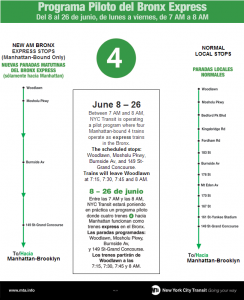 Starting Monday, there will be experimental peak direction express service along the Jerome Avenue El during an hour in the morning rush. Please allow additional travel time at skipped stations. There’s additional information (pics!) posted on this subject at SubChat. MTA New York City Transit is set to begin a pilot program aimed at shortening travel times along the 4 Line with the creation of a new Bronx Express 4 service between Woodlawn and 149th Street-Grand Concourse. The enhanced service will operate for a one-hour period during the weekday morning rush. The pilot will begin June 8th and run through June 26th and be comprised of four trains within a one-hour period during the morning rush. The Bronx Express trains are scheduled to depart weekdays from Woodlawn at 7:15 a.m., 7:30 a.m., 7:45 a.m. and 8 a.m. After leaving Woodlawn, the Bronx Express 4 will make a station stop at Mosholu Parkway before switching to the middle track and heading to Burnside Avenue. From Burnside, the train will make its final Bronx station stop at 149th Street before making all regular express stops along the 4. Customers boarding at Mosholu Parkway and Burnside Avenue will be alerted to the Bronx Express 4 by conductors’ announcements. Customers are being informed of the pilot through the distribution of take-ones printed in English and Spanish, as well as informational posters. This pilot is possible because of the recent upgrades made to the center track signaling system within the 2005-2009 Capital Program. The signal job called for the installation of intermediate signals along the stretch of elevated track between Woodlawn and 161st Street. As a result of the project, we now have a greater flexibility of use with the middle track and can send trains in passenger service as well as work trains up or down the middle track. In the event of a disruption in service or track maintenance, we can also reroute trains onto the middle track. Similar signaling systems, allowing express service, are in place on the Flushing and White Plains Road Lines among others that have three tracks. The results of the pilot will be evaluated after the completion of the three-week period and a decision will be made on whether to make this change permanent. Customers may call our Travel Information Center at 718-330-1234 from 6 a.m. to 10 p.m. daily, or log onto www.tripplanner.mta.info to use Trip Planner to plan their trips. Customers with web enabled phones or PDAs can use our Trip Planner On-the-Go! by going to www.tripplanner.mta.info/mobile; in addition to planning their trips, Blackberry users can download the free icon for one touch access to the service. This entry was posted on Thursday, June 4th, 2009 at 12:11 am	and is filed under railfanning, service alert, subway. You can follow any responses to this entry through the RSS 2.0 feed. You can leave a response, or trackback from your own site. Didn’t they try this a couple of years ago, where they had some trains turn at Burnside Ave? I’m not sure. Maybe someone else has heard of it. I’ll ask around. Also, extend the (3) line to Bedford Park Lehman College every peak hours.